Condo, Studio with great kitchenette sleeps two. Gorgeous beachfront Condo, maid service and airport pick up. 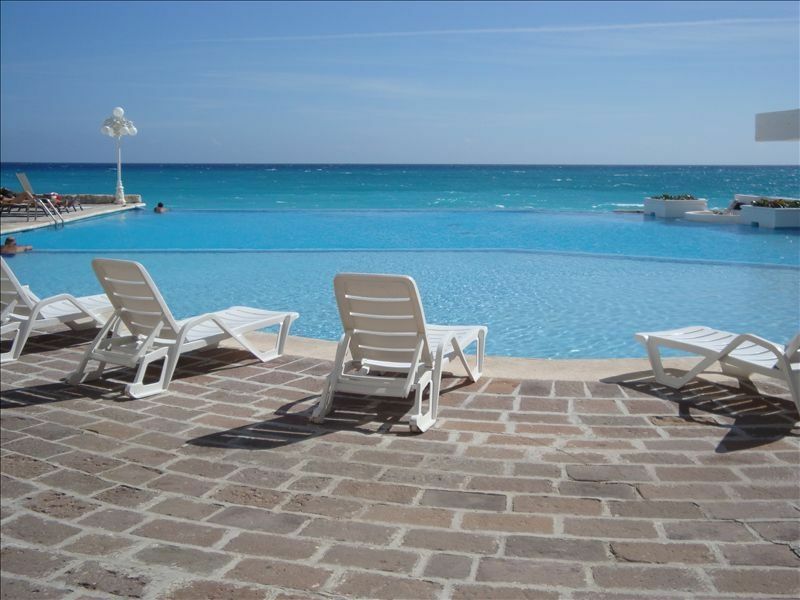 Relax and unwind on your balcony overlooking the beautiful turquoise blue Caribbean sea. Swim in the Condo pool or step onto the beach and swim in the ocean. Sunbathe and enjoy the beautiful white sand. Outstanding views from your private balcony located right on the beach. We have a toaster/induction oven as well as a toaster. All the necessary utensils to cook a great meal should you choose to do so. We have an induction toaster oven, microwave, electric skillet, crockpot, induction hotplate, toaster and coffee maker. Great covered balcony with unobstructed view of the beach and ocean. Patio table and chairs and a lounge chair. The property has everything one could need, and the hosts are the absolute best! ..Spectacular!!!! ... Every morning we felt so lucky to wake up to the bluest sea and the most gorgeous beach, then get to fall asleep to the sound of the ocean....just really amazing. The condo was VERY clean and had everything we needed.....from a large coffee pot, to a blender for our morning smoothie. We drank our coffee on the balcony every morning and enjoyed the view. The onsite restaurant had delicious food, awesome drinks(especially mojito's) and all at such great prices. We ate there a lot! The pool was nice and we never had problem getting a lounge chair, but we spent most of our days on the beach. I can't say enough about the beach...white soft sand, beautiful blue ocean, never crowded, and we always found an open palapa to sit under. This was our first time to Cancun and we loved it. We explored it by taking the very convenient $1 bus ride to the Downtown area and to the grocery store. We could not get over how easy it was to get around and we always felt safe. We were so lucky to experience some authentic Mexican cuisine on a few of our adventures and I can't wait to go back and experience more! My husband and I feel so grateful to have found this little gem, and to have met Robert and Fran, we found a wonderful little Cancun family that we can't wait to see again! Thank you for sharing your home with us and for everything , it truly was the BEST HOLIDAY EVER!!!!! This end of the beach isn't nearly as crowded and you still have the clear waters and nice white sand. The room was good for two people and we didn't spend much time in it. Wifi was in and out but I think that's par for the course. Air conditioning worked well and we didn't have any room issues but we were there for the beach and weren't expecting 5 star. The pool bar and restaurant is perfect with cheap food and great drinks. If you aren't into sight seeing you'll never need to leave the property! Bus is easy to grab and you're still within walking distance to a few restaurants and a convenience store (head to the street take a left). This studio is just the right size for two people. It is clean and bright, but most of all it has the best balcony and inside view. You get a covered, private balcony with view of the ocean and the lagoon. At night you can see the beach lit up with private candlelight dinners, cruiseships sailing past and during the day watch the activity. But by activity it is not 'busy' at all by my standards. The beach isn't littered with lots of boats and sellers of various goods and activities. You'll see some parasailing and jet skiis. Not a lot. The beach also is nice and quiet. By that I mean you can walk down the entire beach and not hear 20 different beach bars playing various party music. There is one club next door that plays music from time to time. However I went during the Mexican spring school holiday and there were only spanish tourists staying at Cancun Plaza and nearby. That started to change by the end of the week. So perhaps the atmosphere will change. I was very happy with having the airport transfers arranged for us. Especially when we landed. Oy! How confusing is it when you get out of the airport? Very. Everyone is trying to grab your luggage. I could firmly say "No. I have a Yellow Taxi" Then when we saw the sign with our names on it, it was a relief to have a reliable driver take us to the condo. The location of the condo was perfect for me. I do like nightlife like going to Coco Bongo, but I don't need to stay close to it. We hopped on and off the main bus constantly. It passes by all the time, and even in between stops the bus will honk at you to ask if you need them. Awesome! I enjoyed La Isla Mall the most and you can walk to it. Its only 4km or 3ish miles. Next to it is my favourite place for wine - La Europa, and next to that is a hidden gem La Fish Fritanga. It looks like a sidewalk take-away, yes it is. Just go down the stairs beside it and it leads you to the main restaurant situated on the beach. Inexpensive, simple food. Nice setting. Next to that is a cigar bar. You might not like cigars, but they also have a wonderful range of tequilas and best atmosphere. Its like stepping into Havana, Cuba. Tropical, old world, classy. Across the street from condo: '19.5km' (name of restaurant) best burgers ever! Huge! 'Navios' Restaurant for Romance. Fran and Roberts' studio is just what we love. Very nice clean, comfortable place with everything we need. Absolutely spectacular view of the sea! Cancun Plaza is well maintained and we feel very safe here. Onsite restaurant, Casa del Mar, serves delicious food, reasonably priced with a panoramic view of the sea. A small onsite store just inside the entrance gate sells snacks and very cold beer. Easy to catch transit buses right out on the blvd can take you up and down the hotel zone. Comforting to know our friendly landlords are nearby. We mostly like to play in the warm, clear water of the sea. Pool is also very nice. Twenty minute walk down the beach past Club Med to Punta Nizuc and you can snorkel from the shore. Thank you, Fran and Robert, for sharing such a wonderful place. Our memories will help warm us the rest of the cold Maryland winter. From the moment I contacted Fran, the entire booking, transfers and stay was a delightful experience. Fran and Robert are super friendly, kind, gracious and caring folks who share their love of Mexico with guests. The condo was perfect for our needs, comfortable, clean and well located. Beautiful pool, gorgeous beach, good restaurant and several little shops close by. $1 bus runs every 5-10 min to get downtown within 15 min. We had a great time and plan to return. Many thanks to our hosts! We are located in the Hotel Zone with public transportation right outside our gates that will take you to shopping, ferries, movies, restaraunts and even Walmart. Captain Hook Dinner Cruise is great fun, we are located close to three beautiful shopping centers, Kukulkan Luxury Avenue, La Isla and the Hard Rock. Lots of clubs and sovenier shopping . Great Restrauants, Outback, Bubba Gumps, Margaritaville, Hard Rock, Chilis, Planet Hollywood and many others. Market 28 is a must!!! Isla Mujeres is a great day trip it is an island about a 30 minute ferry ride where you rent a golf cart and go around the island. For a romantic dinner simply call Casa Rolandi and they will take you on their private yacht to the restaraunt on Isla Mujeres and bring you back all included with dinner. There will be a 20% fee for cancellation within 60 days of arrival and 50% if within 30 days.